Welcome to North Coast Creations December Release! This month, North Coast Creations is releasing two stamp sets that are perfect for the truck and tractor lovers in your life! Dump Truck Birthday and I Dig You are great stamp sets for creating kids birthday cards, invitations or scrapbook pages! Continue reading below to find out how you can win one of two North Coast Creations $10 Gift Certificates good towards the purchase of NCC Stamps. Today, I'm sharing a cards I created with each of these stamp sets. Both cards also use Our Daily Bread Designs Custom Dies and an the Tractor card also uses an ODBD stamp set. Before I share the details of my cards, I wanted to let you know that North Coast Creations is having a Gift Certificate Sale, details can be found on the NCC Blog. NCC is also have a DT Call, click here to read more. This first card uses the dump truck and sentiment from Dump Truck Birthday, I've also used the presents from the Santa's Sleigh stamp set, as they fit wonderfully in the dump truck. I paper pieced the truck using MME pattern paper, cutting out the truck and mounting it over the stamped image. I stamped the presents multiple times on scraps of the pattern paper, paper pieced them and added them to the truck as shown. The truck is mounted on dimensionals and adhered to circles that were die cut using the ODBD Circle Ornament Dies and Matting Circles Dies. 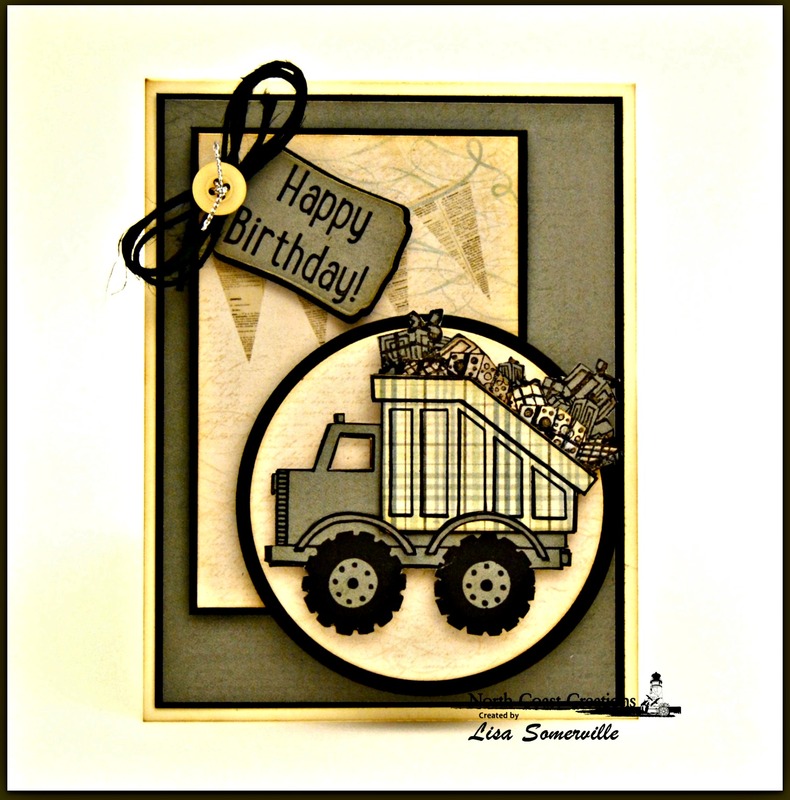 The sentiment is from Dump Truck Birthday, stamped in Black ink on scraps of the pattern paper, then die cut using Our Daily Bread Designs Mini Tags Dies and layered on a Black panel also cut using these dies. 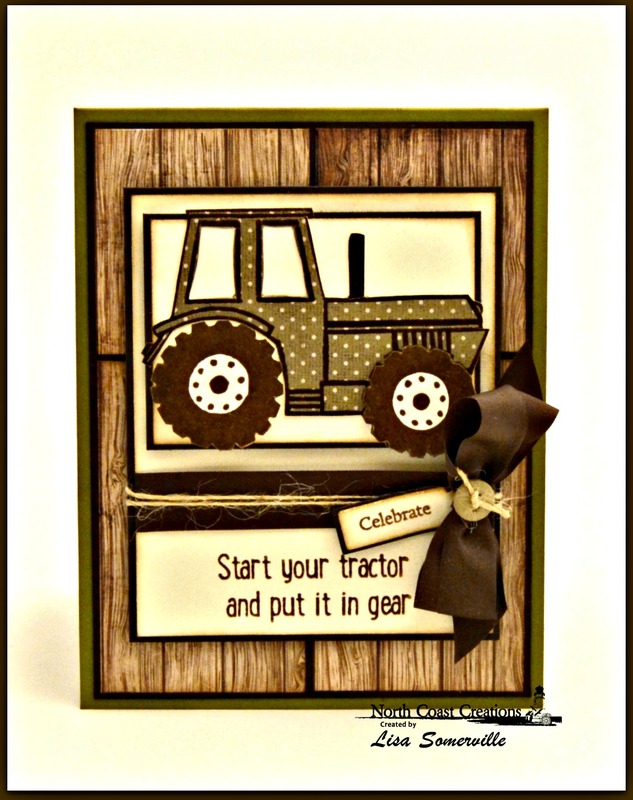 This next card uses the Tractor and part of a sentiment from the I Dig You stamp set, along with Our Daily Bread Designs Mini Tag Sentiments stamp set and Mini Tags Dies. Again, I've done some paper piecing, this time using paper from Farm House Paper Company. All stamps are stamped in Ranger Coffee Archival ink and clear embossed. The tractor tires are popped up on dimensionals. 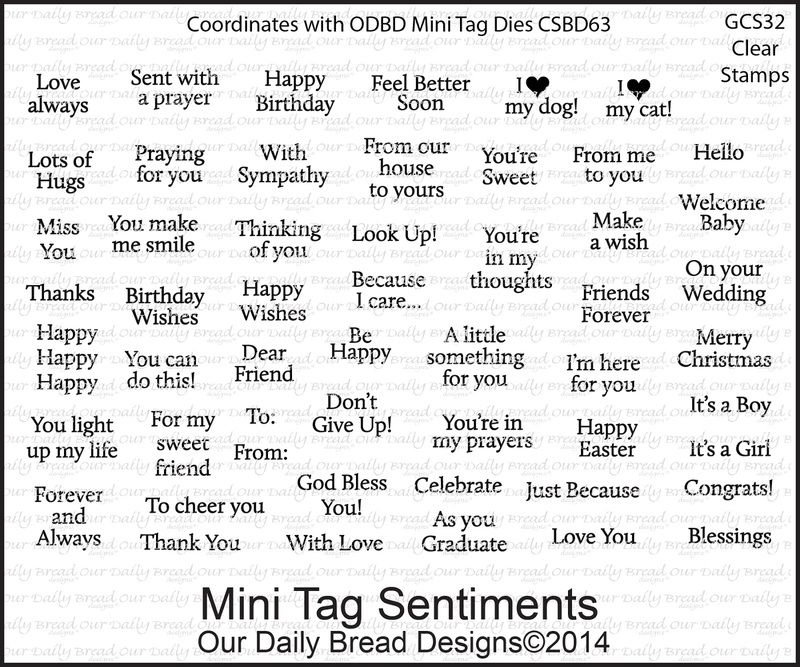 The word "celebrate" is from the ODBD Mini Tag Sentiments stamp set, stamped and embossed on a tag that was die cut using the ODBD Mini Tags Dies, then mounted on an Espresso Tag that was also die cut using this die. To embellish I added Vintage Brown Seam Binding and an Olive Button tied with twine. Two randomly selected winners will each receive a $10 gift certificate to North Coast Creations, good towards the purchase of NCC stamps, just for commenting on the Design Team cards! You have until December 17, 2014 at 10:00 PM EST to leave a comments on the participating designers blogs for a chance to win! Winners will be posted December 18th, on the North Coast Creations Blog, so be sure to check back there to see if you are one of the winners! Oh, how fun!! Love the paper-pieced dump truck and tractor and those presents were a perfect fit! Both cards are super adorable!! HUGS!! I love love love these cards. The dump truck and tractor are prefect for any little boy or a grown man's card. You really rocked that truck, just love it. Very cute. I like the paper piecing and how you put the presents in the truck. omgoodness!! I NEVER would have thought to paper piece these.... too stinkin cute!! and LOVE the packages in the truck! clever, clever you! both are fab samples!! !